While strolling the streets of Warwick, NY with a friend a few weeks ago I happened to glance in the window of Newhard’s (one of my favorite stores). I continued walking until what I had seen registered and I backed up. There was an owl towel hanging in there. 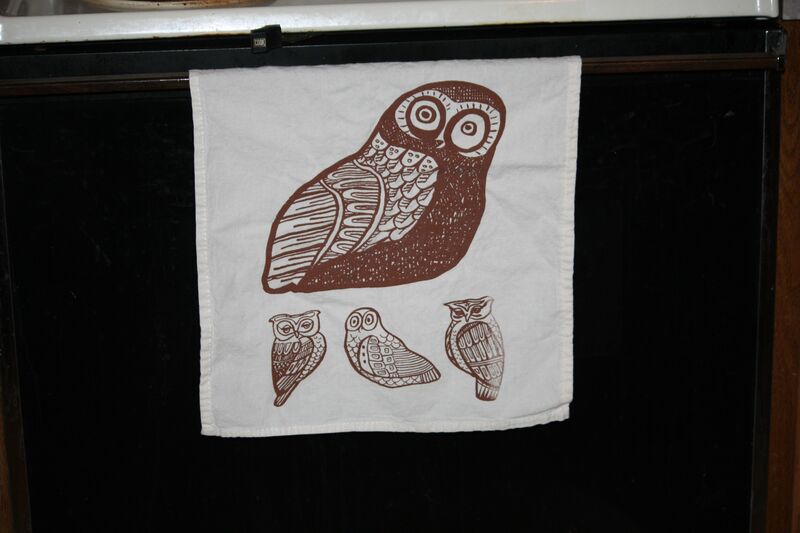 My kitchen towels are a little threadbare and I had just been thinking I needed to get some new ones. They are hand printed silkscreens on cotton by Janet Howard-Fatta, a local artist and come in 3 colors, dark green, brown and a mustardy gold. Now here is the question…What types of owls do you think they are? I have made the decision (finally, after talking about it for at least a year.) to collapse my 2 blogs. Basically nothing will change here other than the name (in the short-term), but the old Murmuring Trees will go away (as soon as I can make a hard copy of the entire thing.) As you can see I flipped the name of the blog already and will start to work on switching to my own domain (yeah, I’ve owned it for, mmm, maybe 2 years). Hang in there with me. We climbed onto the open-air truck with more than a few nervous glances at the dark threatening sky. The day before it had clabbered up and even rained a few drops, but then cleared. We were hoping for a repeat of that. Just as we crossed the Chagres River (where I saw a Gray-necked Woodrail walking on the waterlillies) it started to drizzle. By the time we arrived at the ponds it was a warm steady rain. I popped open my mini-umbrella to protect the camera. We ambled across the street blinking the rain from our eyes and peering up into the trees. The juvenile Rufescent Tiger Heron that I had seen a few days earlier begging for food (and being ignored by its mama) was standing at the edge of the pond. As we stepped onto the grass under the canopy a huge swarm of mosquitos decended like a biblical plague of locusts. We beat a hasty retreat and I passed around the DEET spray (I alway carry it around. Bugs seem to like me.) Once we were chemically protected we turned again to birding. By this time the Tiger Heron was picking its way along the patch of grass next to the road. The light was gray and flat, and I had to use flash, but you can see how beautiful it was strutting amidst the diamond drops. From the top of the Canopy Tower, I was in the sky realm of the Vultures. They drifted over the valley, played in the drafts and chased each other. Black Vultures have a lot of personality, much more than Turkey Vultures. Sorry. But you really need to spend some quality time in the clouds to see it. They are both lovely though in the early morning light. Not for nuthin’ but our world would be pretty gross without them, eh? I drifted out of a dream to the unearthly sound of Howler Monkeys brawing in the new dawn. It sounded like they were right outside of my room. I tossed on some clothes and dashed up 3 flights of stairs to peer into the darkness. I waited, alone in the common room, expecting all of the guests to charge in bleary-eyed and bewildered. Eventually a few guests arrived and we nodded to each other in amazement at the sound. As the sun rose we saw that the monkeys had taken up residence in the trees in the parking lot. As the light got brighter, we could see them better, but they fell silent. I was hoping to get them on video, alas that didn’t happen. But while scanning for any movement in the trees, (yes, I will get back to birds really soon) one of the other guests happened to spot a tiny Geoffroy’s Tamarin jumping through the canopy. The smallest of the Central American monkeys, it is the size of a squirrel. And darn cute. We chased that monkey around and around the tower roof hoping for it to sit for a few minutes so we could take it’s photo. Finally he stopped and look right at me. I suppose I would get used to them, but I don’t know…. while the 3-toed eats the older ones. I am full of lunch and like the slow-moving Sloth, not too motivated. So it’s time for siesta. I’m going out again on a bird tour at 3. The line mark down this guy’s back means he is male, or so I have been told.